Wake up to beautiful sunrises in this Torch Lake Cottage includes a master bedroom with queen bed, loft with twin beds, family room with a queen sofa sleeper and three rollaway beds available. With microwave, cable TV, VCR, charcoal grill and all linens provided. 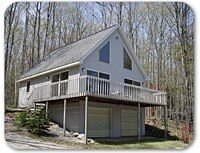 An 8′ x 30′ deck overlooking beautiful Torch Lake with over 70 miles of shoreline boating on the Chain of Lakes. Enjoy quite, peaceful surroundings on a 10-acre setting with 123′ of water frontage. Skiing and snorkeling from our own private pier and there are boat rentals, a boat launch, and Lake Michigan access within 1 1/2 miles.